In the Grandmaster Chime Ref. 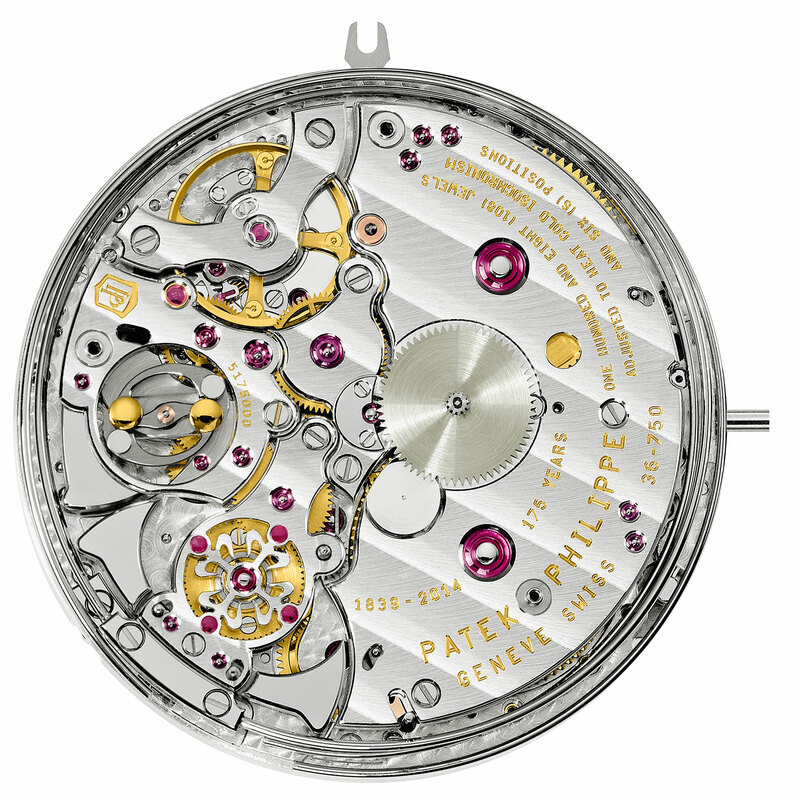 5175 Patek Philippe has combined several traditional complications in a movement that has a whopping 1366 components. Not only is it Patek Philippe’s first grande and petite sonnerie wristwatch, the Grandmaster Chime (who came up with that name?) also features an alarm, date repeater, perpetual calendar and a swivelling, double-faced case that can be worn on both sides. This grand complication is presented in a 47.4 mm case decorated with an ornate laurel wreath motif. Technically and aesthetically, the Grandmaster Chime is a lot more than what many would ask for. The front dial (when the crown is pointing to the right) displays the various chiming related and second time zone functions from 1 to 11, while the back is concerned with the perpetual calendar. The grande and petite sonnerie chimes the time en passant, or as it passes. Considered the most difficult complication in all of watchmaking, the grande sonnerie is only found in a handful of other wristwatches. The Grandmaster Chime has an unusual 30 hour power reserve for the grande and petite sonnerie, thanks to two barrels just for the striking mechanism; typical grande sonnerie watches have one barrel for the time and another for the chimes. 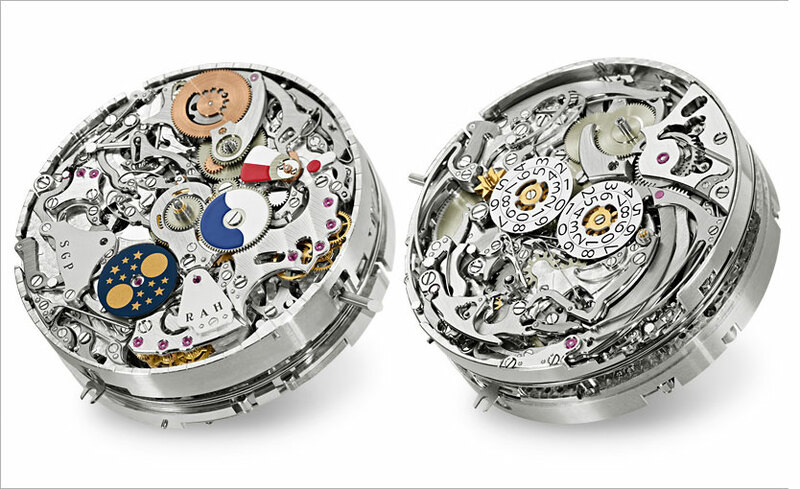 Two other striking complications have been integrated into the movement: a minute repeater and an alarm. Unlike most alarm watches, the Grandmaster Chime alarm strikes the entire time sequence, with the minute repeater essentially functioning as an alarm – a world first. Another world first is the date repeater. This sounds the date with a double chimes for ten day intervals and a high chime for single days. The 31st of a month will thus be composed of three double chimes and one high chime. The reverse of the watch shows all the sub-dials of the instantaneous perpetual calendar, along with the four digit year display. All calendar displays, save for the year jump crisply at midnight. Unlike most other year display perpetual calendars like that from IWC that go only forward, the year display of the Grandmaster Chime can be set forward or backwards via pushers in the case. 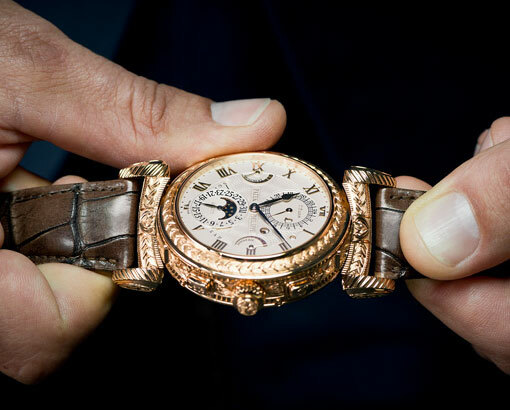 The watch can be worn on either of its two faces thanks to a swivelling case, a first for Patek Philippe but used before by other brands like Franck Muller. Both sides indicate the time, with the front dial showing all the striking functions (like power reserve and sonnerie mode) as well as second time zone. The reverse dial is for the perpetual calendar. 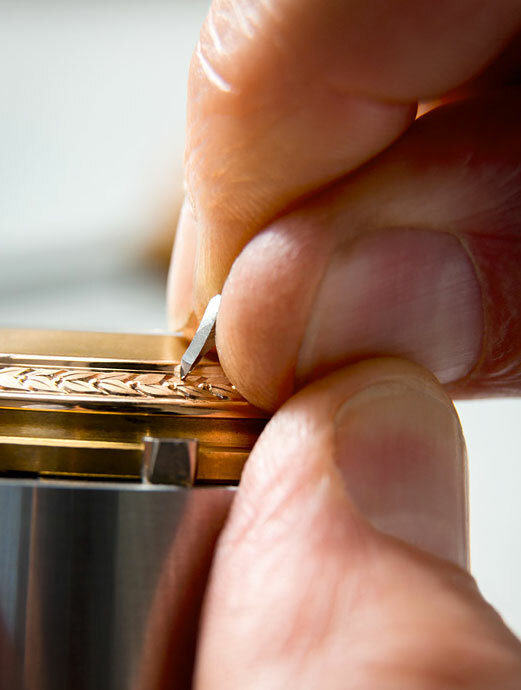 Measuring 47.4 mm in diameter and 16.1 mm high, the case of the Grandmaster Chime is in rose gold and entirely hand-engraved with a laurel wreath motif, as is the folding buckle. This case reflects an inclination towards ornate case styles obvious in recent years,notably with the Sky Moon Tourbillon Ref. 6002G. 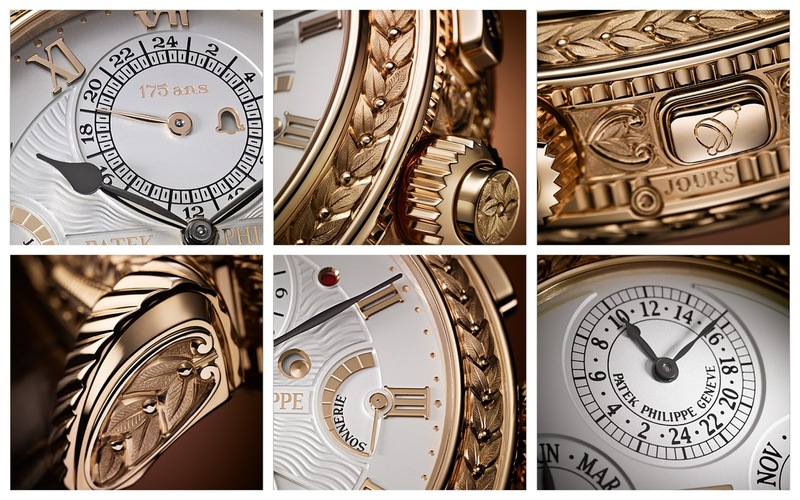 The obvious comparison is to the Lange Grand Complication unveiled last year that costs almost the same. At 50 mm in diameter, the Lange is even larger than the Grandmaster Chime and boasts a grande and petite sonnerie, split seconds and lightning chronograph and a perpetual calendar. While the Lange is in essence a modern replica of a vintage pocket watch, both in terms of movement and design, the Patek Philippe does possess some notable innovations, including the date repeater and time striking alarm. 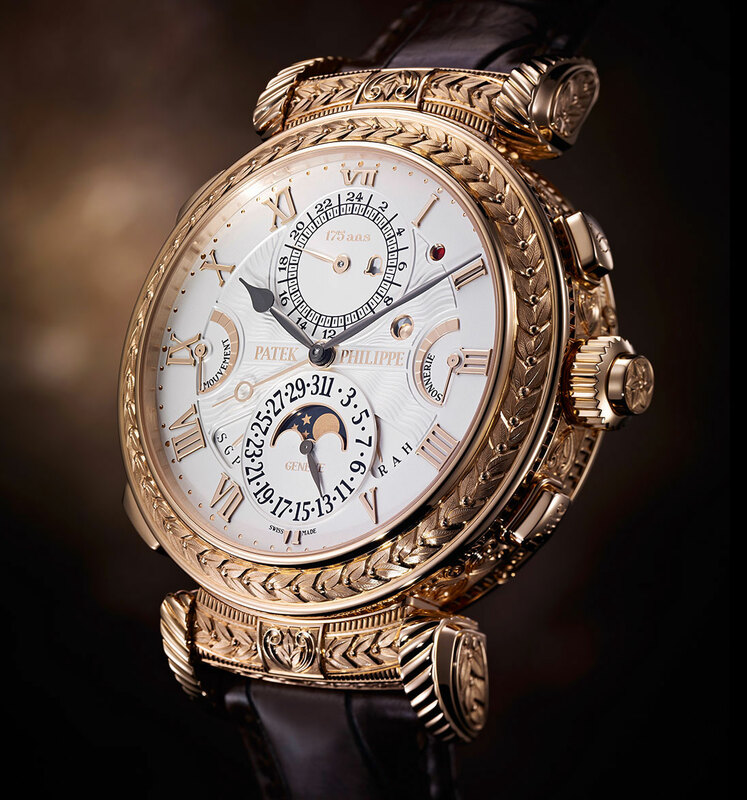 Limited to seven pieces, one of which will reside in the Patek Philippe Museum, the Grandmaster Chime Ref. 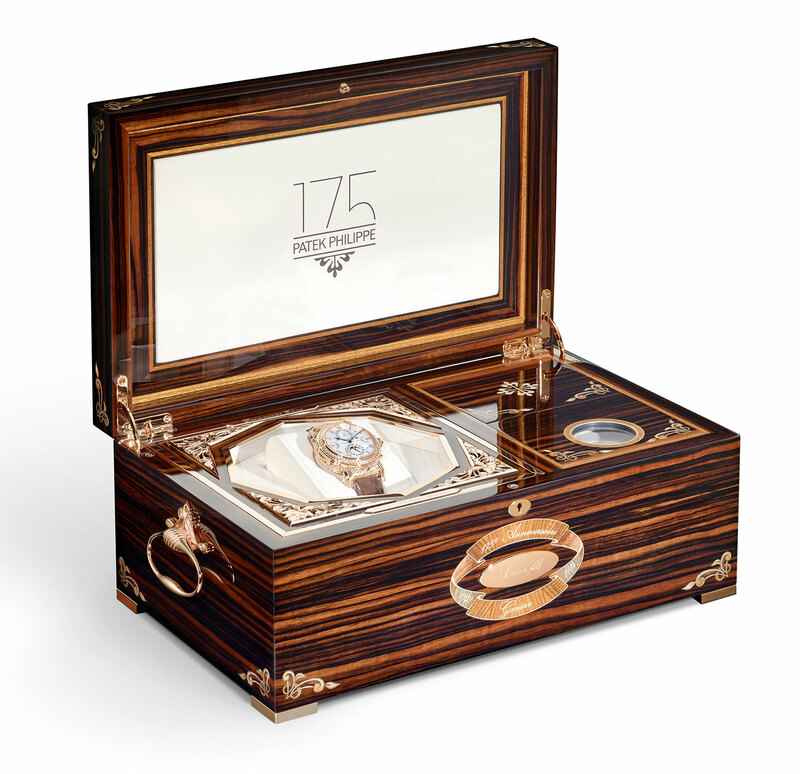 5175 is priced at 2.5 million Swiss francs, equivalent to about US$2.63 million.